The Executive Magazine takes an up close and personal look at the latest horological release from MB&F, the Horological Machine No9 ‘Flow’, inspired by aerodynamics and automotive design. 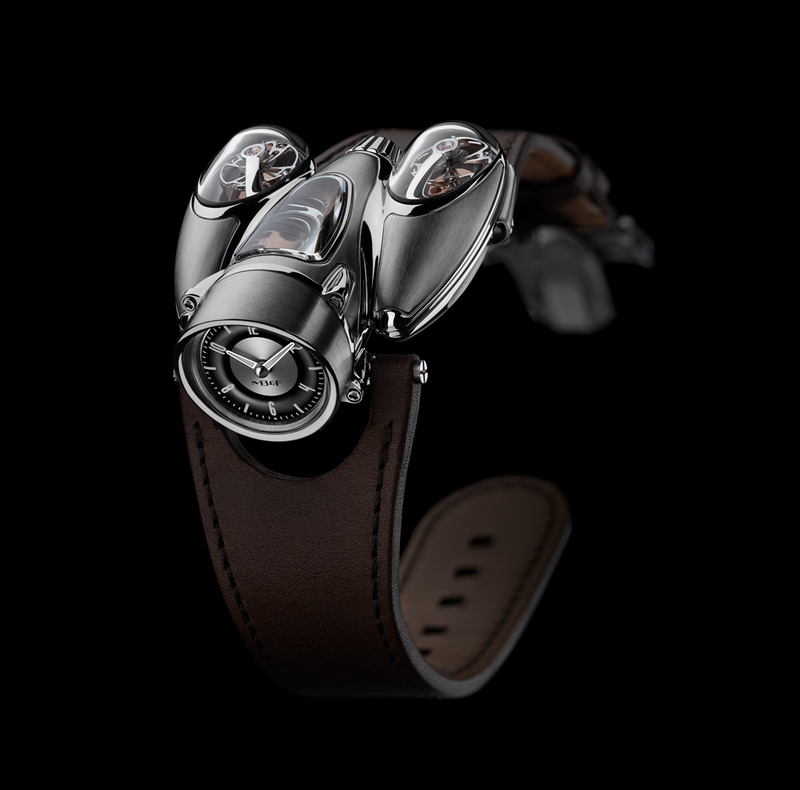 With a design led by form over function, taking inspiration from aerodynamic principals and futuristic retro automotive shapes, the brand new MB&F No9 ‘flow’ looks like a mechanical piece of art. Taking cues from 1950’s aeronautical styles and retro representations of a futuristic utopia, the time piece is like nothing we’ve ever seen before. 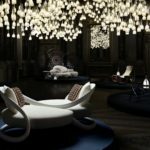 MB&F are globally renowned for their audacious designs, and the HM9 is no exception, with its trademark unconventional form, transgressive case shapes, and artistic use of exotic materials. So pronounced are its curves, and acute are its angles, that new manufacturing standards and techniques needed to be developed to achieve its fascinating finish. When you take a closer look at the watch, the level of detail is staggering, from the complex grade 5 titanium case enveloping the movements and complications, to the winding mechanism and the elongated domes of milled sapphire crystal. The dramatic geometry of HM9 is supported by the equally dramatic contrasts of finished surface, with machined titanium, polished lines and satin finished details. The engine of the HM9 has been entirely built in house at MB&F as a result of three years of development, and features independent twin balance wheels that beat at their own independent cadences of 2.5Hz (18,000bph) on each flank. A planetary differential averages the output of both oscillating wheels to provide one stable reading of the time. The small and simple dial sits perpendicular to the mechanism, with the hands driven by conical gears which ensure precise engagement, even when motion is put through a 90° planar translation. All of which results in the most accurate time keeping possible. HM9 makes it’s debut with two titanium editions, limited to 33 pieces each: – The ‘Air’ edition comes with a dark movement and aviator-style dial; – The ‘Road’ edition has a rose gold plated movement and a classic speedometer-style dial. Measuring 57mm x 47mm x 23mm on the wrist, this is a large time piece by any standard, and certainly makes for a dramatic statement. 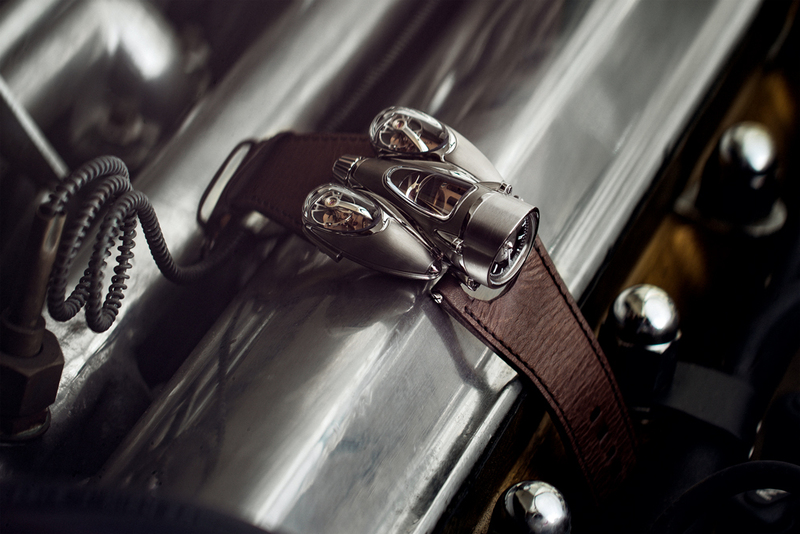 The strap is hand-stitched brown calf-leather with a custom-designed titanium folding buckle.